Taylors Barn01263 715779work01603 870304fax Self-catering....and relax! 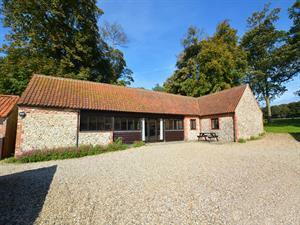 If you are looking for a location in a quiet spot to soak up the wonders of rural Norfolk then this is the place for you! Located between the popular Georgian town of Holt and the pretty coastal village of Cley, Taylors Barn offers stylish open plan accommodation which has been finished to a high standard. Complete with use of a Games Barn, and a woodland play area you can keep the children entertained whilst you switch off and relax. Sounds ideal doesn't it! • Pets: One large/two small dogs welcome. Please be aware of booking information regarding pets. • General: Under floor central heating. Woodburner - starter pack of fuel provided. • Rooms: 3 Bedrooms (1 En-suite), 2 Bathrooms, Open plan Sitting/Dining/Kitchen area, 1 Bathroom, 1 Cloakroom. Utility room/Games room in separate building. • Other: Towels. Travel cot, Books and games provided. Travel Cot & highchair. • Outdoors: Shared court yard with Bixes Barn to front. Private patio to rear of property with table and chairs and charcoal barbeque also communal woodland area to rear with swing and slide. There is an Accidental Damage Deposit or Accidental Damage Deposit Waiver for this property. Where applicable we will contact you in good time before your holiday with further details and to take payment. ....and relax! If you are looking for a location in a quiet spot to soak up the wonders of rural Norfolk then this is the place for you! Located between the popular Georgian town of Holt and the pretty coastal village of Cley, Taylors Barn offers stylish open plan accommodation which has been finished to a high standard. Complete with use of a Games Barn, and a woodland play area you can keep the children entertained whilst you switch off and relax. Sounds ideal doesn't it!